Eid means celebration, festival. Eid al-Fitr is the Celebration of Breaking the Fast after Ramadan. Eid al-Fitr as occasion of holy celebration and thanks giving was originated by the Messenger, may profound peace and blessings of Allah saturate his noble soul. It is observed on the first of the month of Shawwal at the end of the month of Ramadan, during which Muslims undergo a month long period of fasting. When the Prophet arrived in Madinah, he found people celebrating two specific days in which they used to entertain themselves with recreation and merriment. He asked them about the nature of these festivities at which they replied that these days were occasions of fun and recreation. At this, the Prophet remarked that the Almighty has fixed two days [of festivity] instead of these for you which are better than these: Eid al-Fitr and Eid al-Adha. Since then both the festivals are celebrated by Muslims or all school of thoughts irrespective of region or race. Eidul Fitr is the festival when Muslims offer special prayers and thank Allah for the successful end of the month of fasting and prayers. A saying of the Prophet says that the Eidul Fitr is a reward from Almighty Allah (swt) who is pleased with his slaves following their month long fasting. The holy Prophet advises the Muslims to celebrate Eid by offering prayer, thanks giving Almighty Allah, and forgiving each other. How did the Prophet & his companions celebrate Eid? • The Companions, may Allah be pleased with them, used to recite Takbeer during the night of Eid from sunset on the last day of Ramadan until the Imam came to lead the Eid prayer in the morning. • They raised their voices in supplication and remembrance of Allah in the marketplaces, mosques and homes, but the women did so inaudibly. • The Prophet would not go out on Eid al-Fitr until he had eaten an odd number of dates. (Ahmad and Al-Bukhari) In Al-Muwatta, it is recorded from Sa’id Bin Al-Musayyib that the people were ordered to eat before they went out for prayer on the day of breaking the fast. • The Prophet and his Companions paid Zakat Al-Fitr before the Eid prayer, or even a day or two in advance. • After the Eid prayer, they dispersed by a route that was different from the one they took to approach the Musalla. The Islamic Tarbiyah (upbringing) imparted by the Prophetic traditions is not restricted to the outward aspects of worship, it goes deeper and teaches us the correct spirit of celebration. Sheikh Muhammad Al-Jibaly writes: “The major part of the celebration is not eating or drinking – rather, it is a prayer that brings Muslims together to remember Allah’s bounties and celebrate His glory and greatness. 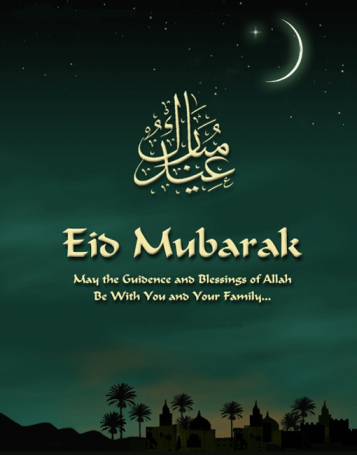 The Eids and their celebration in Islam carry a distinctive meaning and spirit. They are completely different from the celebrations in other nations and cultures. For other nations, a holiday is a chance to immerse in worldly pleasures, or to involve oneself in prohibited acts to the utmost. Not so for Muslims! 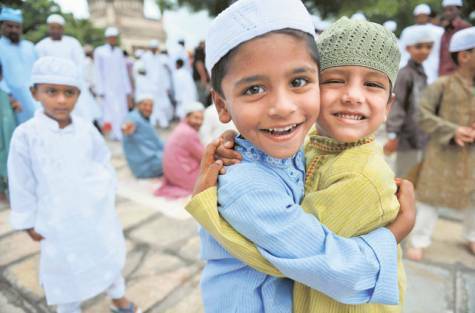 For Muslims, the Eid is an occasion to increase in good deeds. Each Eid marks the conclusion of an important worship, and the determination to continue in obedience and submission to Allah. 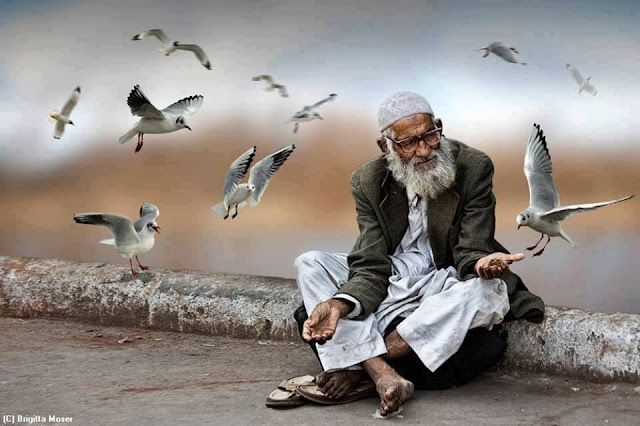 In moments of extreme pleasure or sadness, a Muslim never forgets his Lord’s greatness, might, glory, and watchfulness. A Muslim’s actions are always controlled by this continued remembrance and awareness. There are several instances where the Prophet permitted Ayesha, may Allah be pleased with her, to indulge in suitable recreation on Eid. Ayesha said: “The Messenger of Allah, entered the house and I had two girls who were singing about the battle of Bu’ath [a 120-year battle between the tribes of Aws and Khazraj that ended with the advent of Islam]. 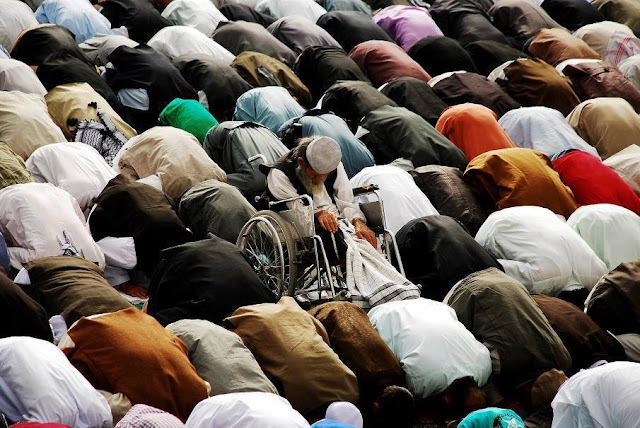 The Prophet (peace be upon him) lay down on the bed and turned his face to the other direction. May Allah grant that we become increasingly more mindful of the gifts and blessings of Allah, we become more grateful and also to offer our compassion and mercy to those near us through acts of charity, goodness and love. Eid Mubarak to you all.